Call it the power of incumbency. Mayor Jon Netts and council member Holsey Moorman are well ahead of all other contenders in the three races for Palm Coast city council, according to the latest financial reporting period, which closed at 5 p.m. today. Netts is leading the group with $8,600 total contributions so far, $2,000 of which are a loan from himself to the campaign. That still leaves $6,600 in smaller contributions (the highest is $500, from long-time friends and supporters John and Mary Slattery), most of them in small amounts of $100 or below. One of those $100 contributions in the latest report is from Mary DiStefano, the council member vacating her seat in November. She is term-limited. Netts has also received $100 from Gail Wadsworth, the clerk of court. Netts still has almost $2,000 on hand, with 18 days to go before the Sept. 13 primary. Netts’ leading challenger, Charles Ericksen raised $4,469 so far and spent $3,119. Ericksen put in $1,150 of his own. His largest contribution is also $500, from Carol Sharp, a person Ericksen says he’s had to meet in person–they’ve exchanged correspondence–and $500 from Jack and Samantha Howell. Joe Cunnane has collected $3,374. The most visible politician supporting Ericksen is Nate McLaughlin, the county commissioner, who’s returning the favor: Ericksen helped McLaughlin run his campaign for the commission. The three mayoral candidates will face each other in the Sept. 13 primary. Should one of them get better than 50 percent of the vote, he’ll be elected mayor based on that result. Should the race not yield an outright winner, the top two vote-getters will face each other in the Nov. 8 general. The two races for city council seats won;t have a primary, since each is being contested by just two candidates. They face each other on Nov. 8, so the money race will be far from over this summer. Cunnane, incidentally, declined to say how much he was lending himself for his campaign. He said he was eating dinner, and all the amounts in these races were “small potatoes” anyway. In District 3, the seat being vacated by DiStefano, Grand Haven’s Dennis Cross is outraising Jason DeLorenzo, with $4,569 so far. He spent $3,090 of that. But $2,000 of Cross’s fundraising is actually a pair of loans to himself. 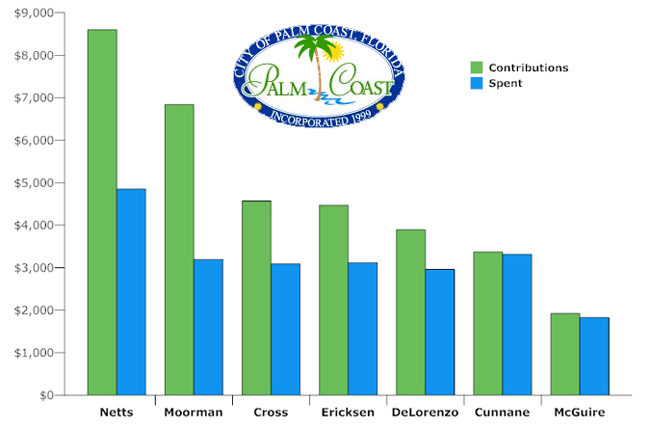 In comparison, while DeLorenzo raised less overall, almost all but about $100 of the $3,895 he raised is through individual contributors. Maybe our incumbents and running candidates in the City can support and get further involved in the potential restoration of the Matanzas Woods Golf Course that has further eroded the value of the homes around it. Being informed is very important and find out what this is all about. Good luck to all the Matanzas Woods neighbors. Also lets see what can be done to recover our Palm Coast Marina illegally sold to Centex and now in the hands of Pulte and before the statute of limitation for Palmcoasters claim expires. That Marina is still a money maker.